Here’s a cheat sheet of what we know about potential newsstands so far. Google is hoping to launch an e-newsstand selling publications for Android. The Wall Street Journal reported that Google has been in talks with publishers, including Time Inc., Condé Nast and Hearst. Sources say Google plans to go head to head with Apple by telling publishers it would take a smaller slice of sales than the 30 percent cut Apple typically takes on app sales. And Google plans to be more open to providing customer data than Apple currently is (which admittedly isn’t saying much). The plan is tentative at this point: Google wouldn’t confirm the report, stating only that they are continuing to talk to publishers about working together with technology or subscription services. Nine months after the launch of the iPad, Apple is (still) reportedly developing a digital newsstand for publishers to allow them to sell magazines and newspapers. 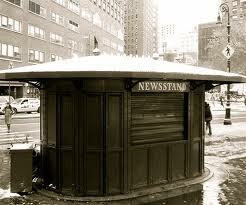 Speculation about the newsstand has been seeping out for months, but Apple hasn’t announced anything official. Some expect the plan to be unveiled in conjunction with the iPad 2 this month. Apple is looking into offering subscriptions, but still keeping 30 percent of the tab, according to The WSJ (unconfirmed by Apple). At minimum, Apple seems ready to throw publishers a bone by sharing limited data about who downloads a publisher’s app. Publishing sources told MediaMemo’s Peter Kafka a similar story. One thing we do know about Apple’s platform is that it won’t be called iNewsStand ― because that name is already taken by PixelMags, a digital publishing platform vendor. The company said this week that its pending iNewsStand application is scheduled to launch in the second quarter. “Game-changer” also happens to be the words Next Issue CEO Morgan Guenther used when referring to his company’s forthcoming digital storefront. The media consortium plans to offer a digital storefront for publishers early this year, and recently teamed up with Vindicia, a subscription management platform vendor that will provide billing options for the store. Initially the storefront will provide digital editions for magazines and newspapers only for Android tablet devices. Other features Next Issue Media has teased but not officially announced include: bundled subscription options between print and digital (and maybe even across different publishers); the ability to purchase content from any device; and publisher access to owned or shared customer data. It’s been more than a year since the joint venture was announced by Condé Nast, Hearst, Meredith, News Corp. and Time Inc. We still don’t know much, but, alas, we somehow still know more about Next Issue than other platforms. Publishers, no doubt, are looking forward to seeing what really is game-changing for digital publication sales. Did we miss any other newsstands that popped up while writing this post? If so, please let us know.